Very basically speaking, recrystallization temperature is the point at which a metal becomes sufficiently ductile to be shaped without breaking. Ductility is the measure of a material’s capacity to be shaped without breaking. Generally, the higher the temperature to which a metal is heated, the higher its ductility. Hot Rolled Steel – Block Steel Corp. When steel is heated beyond its recrystallization temperature and pushed between a set of rollers, the sheets that emerge from the rolling process exhibit qualities of high strength and good formability. This type of steel is not as hard as cold rolled steel, but is often used for high strength and structural applications within the automotive, appliance, railroad and ship building industries. Hot rolled steel is used for a wide variety of products, such as frame components for cars, wheels, tubing, agricultural equipment parts and machinery parts. It is usually a blue-grey color and is only painted if it has been pickled with zinc or iron phosphates. This type of steel is available in yield strengths up to 60 ksi. To produce hot rolled steel, steel service centers heat semi-finished slabs of steel nearly to their melting point in a furnace, where they become easily moldable. The slab is pushed through a set of rollers, a process comparable to rolling cookie dough with a rolling pin. Its thickness is cut down from eight or nine inches to between one and 1.5 inches. The steel is then cropped into different shapes by a pair of steel drums with large shearing blades and left to return to room temperature. As it cools, a metallurgical transformation in the steel’s crystal structure takes places, which hardens the steel considerably. Outside processing, such as pickling, temper rolling, re-squaring, slitting and cutting-to-length is done after the rolling process is complete. Pickling, for example, is the process of surface treating hot rolled steel with strong acids. 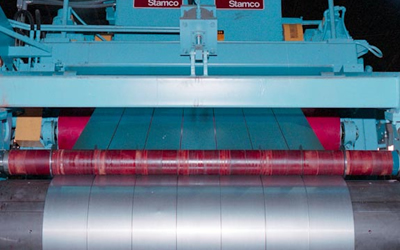 Because steel is susceptible to oxidization, especially when exposed to heat, hot rolling can cause an undesirable film to form on the surface of the steel. Pickling can remove this film without risking deformation to the steel’s surface. Other physical machining processes can also be used to remove such films. Hot Rolled Steel Hot rolling is a metal forming process in which a metal is heated above its recrystallization temperature and rolled into a shape by a series of rollers.